Government policy promoting cycling is being undermined due to safety concerns by the agency which oversees Luas and Metro projects. Taxpayers may end up footing the bill to retrofit the multimillion euro Metro North from Dublin to Swords because of the stance against Government policy taken by the Railway Procurement Agency (RPA). Safety concerns were given by the state agency as the reason for only allowing folding bicycles on its trams. Introduced in April 2009 by Fianna Fail transport minister Noel Dempsey, the National Cycle Framework Policy says bicycles will be accommodated on off-peak trains and on trams where passengers are not affected. The Government’s key ‘Smarter Travel’ policy also backs bicycles on trains. The policies were secured as Government policy by the Green Party as part of the Renewed Programme for Government last October. But when it comes to bicycles on trains and trams the policy is still ignored by the RPA. “If bicycles are not to be allowed, what of other objects accompanying passengers – large suitcases, sporting equipment, prams, wheelchairs and other mobility aids? A bicycle isn’t any more inherently obstructive or dangerous than any of these,” said Colm Moore of the Dublin Cycle Campaign. The cycle campaign notes how allowing bicycles increases train use at off-peak times. Train makers Bombardier and CAF which are part of groups bidding for Metro North both build trams and trains which carry bicycles, although the final interior specifications will be decided by the RPA. The RPA also claimed the section of the national cycling policy covering trains and trams was only an “objective” and that it will be subject to a more detailed study. The policy, however, only says that finding suitable bicycle restraints would be subject to a detailed study. Rail Users Ireland, the national rail users group, says it is simple to put straps on trains and trams to allow bikes to be restrained, they add that trams can easily handle three to four cyclists off peak in their current format. However, after objections from cyclists groups in Manchester, the city’s transport authority is now reviewing its decision to ban bicycles from trams. Campaigners in the city protested using ironing boards to highlight larger items still allowed onboard the Manchester trams. The Greater Manchester Cycling Campaign pointed out that bicycles are carried on trams in Frankfurt, Cologne, Istanbul, Minneapolis, Porto, and Rotterdam. 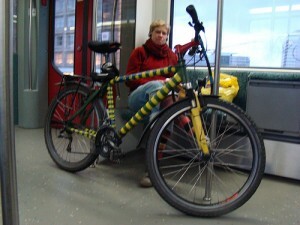 Elsewhere, bicycles are carried on metro and regional rail networks in Denmark, Germany, and the Netherlands. In the United States, cities such as Washington DC and Los Angeles allow bicycles on their metros and urban buses. Meanwhile, Irish Rail is running a pilot scheme of carrying bikes on suburban trains. The semi-state company was heavily criticised last year for the lack of provision for bicycles on Intercity trains. But campaigners say progress has been made in this area. “We now have bikes on all intercity and regional trains and have this listed in the timetable and online, it took a lot of work to get this in place. That’s a key step forward,” said Mark Gleeson a spokesman from Rail Users Ireland. Tom Manning at the RPA said the agency is implementing other sections of the national cycle policy. He said 250 bicycle parking spaces would be provided along the route of Metro North, sheltered parking will be included at all stops in the Fingal County Council area, and the RPA has agreed with the council to widen footbridges to facilitate cyclists and pedestrians. However, Dublin Cycle Campaign called the RPA’s planned bicycle parking provision “inadequate.” It points out that it is a fraction of what is required under the Dublin City development plan; the campaign says the development plan figures may be excessive at some Metro stops but more of an effort should be made to provide space for bicycle parking. Have they any problem with prams, buggies or wheelchairs?